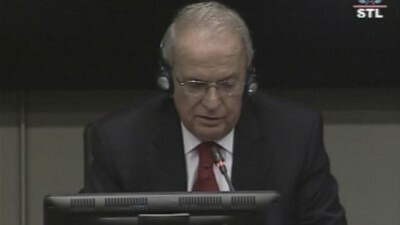 After testifying Monday at the Special Tribunal for Lebanon that the conflict over the Syrian presence in Lebanon had paved the way for the assassination of former Prime Minister Rafik Hariri in 2005, MP Marwan Hamadeh resumed on Tuesday his testimony before STL , focusing on Syria’s hegemony over Lebanon, according to Lebanese media reports . In his testimony on Tuesday he addressed the Syrian leadership’s opposition to the Taef Accord and attempts to execute the remaining articles of the agreement that were not implemented at the end of the Lebanese civil war. The MP recounted how he had proposed to Hariri to include the implementation of the remaining articles in a ministerial statement in 2003. “I had presented to Hariri in 2003 some articles of the accord that had not been implemented, such as Syria’s withdrawal from Lebanon, to which the former PM responded, ‘Do you want to kill us both?’ before throwing the sheet in the trash,” revealed Hamadeh. “Hariri believed that referring to the Taef Accord in the ministerial statement would be tantamount to a declaration of war against the Syrian regime,” he added. The lawmaker stated that Hariri had reservations over Syria’s influence over Lebanon, confiding to him of the pressure he was under from Syrian officials. “Hariri was very annoyed with this influence and he used to relay to us the details of his meetings in Damascus and with (Syrian intelligence chief in Lebanon) Rustom Ghazali,” he continued. “I used to meet with Hariri on an almost daily basis and his greatest concern was how to diminish Syria’s influence, such as through parliamentary polls,” he said. In addition, he remarked that Hariri’s annoyance with Syria reached a peak when he decided in 2000 to withdraw from political life in Lebanon. Following the closure of MTV in 2003, Syrian officials directed their pressure to An Nahar newspaper, of which Hariri was a shareholder. “Syrian President Bashar Assad used to get upset with the articles of Ghassan Tueni and Samir Kassir, so he sought to close or bankrupt the daily,” Hamadeh who is Tueni’s brother-in-law revealed . Hamadeh testified that the Syrian leadership forced Hariri to sell his shares in the newspaper and make individuals he was affiliated with at its board to do the same . “The Syrian regime sought the bankruptcy of An Nahar newspaper after the closure of MTV in 2002,” he added. The MP, who miraculously survived an assassination attempt in October 2004, for which Syria was blamed is expected to testify for three to four days. The content of this article is for information purposes only and is not meant as an advice to take any sort of action. If you have specific questions about the above issues, you should talk to an ISIS representative. yes and to talk to a isis representative, all you have to do is go thru. the march 14th clan, they helped setup the isis in lebanon! ‘Clans’. Plural. Gangs of tribalists. Same as in Iraq. Basically, the Middle East. Eventually someone lifts a carpet, and all the crap swept under it is exposed. If you can’t blow it away fast enough, everyone will come to know it was there for years – and getting rid of the more expensive housekeeper can be seen as having Not been good idea, even as most will not put the blame for that on anyone anyway. It seems better to simply continue to ‘deny, deny,deny’. And even After this is all ‘out’ and can be seen, there will be those who ignore it. Even as they lived it. And poor Hariri. “‘Do you want to kill us both?’” …. well, even after trashing the idea, ‘they’ (Bashar) tried, and did more than one of them in. Hiding truth doesn’t help much, does it. But we don’t need a man testifying in court. EVERYONE knows Syria’s sticky fingers have caused Lebanon to fail, even with those who attempted to preserve it paying heavily for their efforts. Assad was planning all along the assassination of Gebran Tueni and Samir Kassir because they made him look so bad . After Hariri backed 1959 resolution Assad changed his calculation and decided that Hamadeh should go first because he drafted it ( the resolution ) and Hariri should follow because he backed it . Kassir had to go next because of his An Nahar editorial column in which he wrote strong articles against the Syrian regime and then his boss at An Nahar Gebran followed . It looks like Hezzy did the dirty work. If there is any lawmaker that is honest in lebanon, is Mr Hamadeh. The plan of killing of previous prime minister harriri is obvious and everyone knows well who killed him. Asking for the withdraw of the syrian army of Lebanon was a legitimate and still is. Lebanon was and still is an independent country.